Ok, so here's the plan...: I made it! The train I was just on kept saying "service to cockfosters." I am super tired so that may have made it extra funny. I'm not mature enough for London. 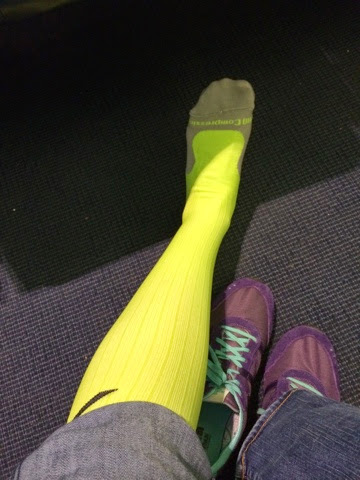 I was super cool and put on a pair of pro compression socks in the middle of the airport. We were supposed to board at 9:45 and leave at ten, but we didn't end up boarding until around 10:30. Then we sat on the plane for over an hour because they took our flight crew for another (somehow more important) flight. We had to wait for a standby pilot to arrive at the airport. Anyway, we ended up leaving around midnight. I slept some, but I felt like I woke up every few minutes to try to get comfortable. I made it through customs/immigration with no trouble and then walked forever to get to the train. Fortunately, the place Tom is staying only required me to take one train with no transfers so I managed just fine in my sleep deprived and mildly dehydrated state. Now I'm off to shower and possibly nap. 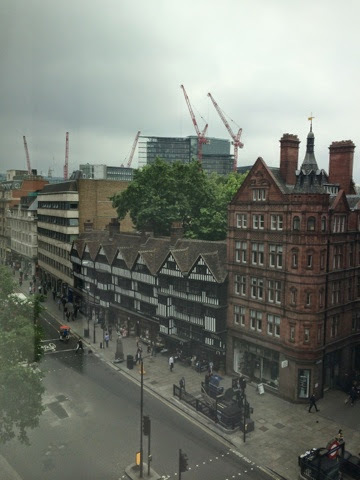 Tom is at work for a bit still today, so I have some time to kill, relaxing and people watching from the window. Woohoo! I would have giggled at the train announcement too. :D HAVE FUN! I love the view! Glad you made it and didn't take the wrong train/bus like your mother:) Although that is fun , too! oh mean, overnight flights are exhausting. hope you get some good rest!